along with the announcement of a few lucky winners. I will be contacting you shortly to gather up your addresses. Congratulations and thanks so much for entering, everyone! I loved reading your comments about comfort food. 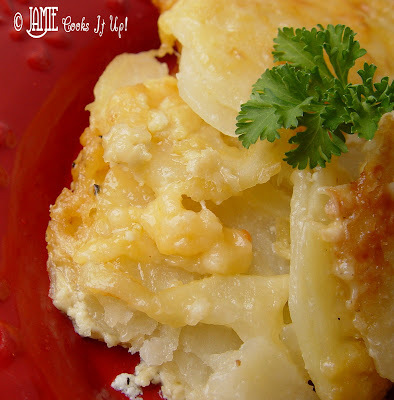 Up today, front and center is a wonderfully tasty recipe for Cheesy Au Gratin Potatoes. I found this little treasure at Mels Kitchen Cafe. She’s a good one, that girl. Her site is chuck full of fabulous recipes. and is perfect served with Grandpa Marks Meatloaf. 1. Peel your potatoes and slice them as thin as you can. You need them to be about 1/8 of an inch thick. 2. Spray a 3 quart baking dish with cooking spray. Layer half of the potatoes evenly over the bottom. 4. In a medium sized mixing bowl combine the cheeses and the cornstarch. Just toss them around with your fingers to get them all combined. Sprinkle half of the cheese mixture over the potatoes. 4. Layer the rest of the potatoes over the cheese and sprinkle with salt and pepper. In a large measuring cup combine the half and half and the chicken broth. Pour it over the potatoes. 5. Sprinkle the rest of the cheese over the top. Cover and bake at 350 degrees for 45 minutes. Remove your cover and bake for the remaining 20 minutes, or until the potatoes are cooked through. My husband LOVES these potatoes. I will have to make them soon. Thanks! Cheese and potatoes! Yum!! Definitely making these tonight. Congrats to the cookbook winners! I love au gratin taters, so decadent and good. Put some fresh herbs on top and I am in LOVE. I have sort of a strange question. I frequently want to make things for dinner that all have to be baked (i.e. meatloaf and cheesy au gratin potatoes) but I only have one oven. Some things with short baking times I can stagger…but not always. So my question is, is it ever possible to bake 2 things at once? Especially if the two dishes are small (there are only 2 adults & 1 baby in this family) and don't take up the whole oven? Could I bake a small version of the meatloaf and potatoes and bake them together? Thanks for your help. I love ALL your recipes! Love your step-by-step photos! And I'm happy you like this dish – it is so classic. It is made and devoured often around these parts, too! I found your blog recently and am loving it! I noticed that the recipe above didn't have a temperature listed to cook the potatoes. I'm guessing it's 350 degrees? I jumped over to Mel's Kitchen Cafe and that's the temp. she cooked them at. Thanks for the great recipes! YAY!!! I am so excited! I can't wait to get the book! Thank you so much Jamie!!! Also this recipe looks fabulous!!! I will be trying it for sure! Thank you again! Your question is not strange at all! And you will be pleased that the answer is most definitely yes. I cooked both the Meatloaf and the Au Gratin Potatoes at the same time in my oven, side by side. You need to be a little more cautious if you put one on top rack and one on the lower. They would need to switch places half way through the cooking time. Hope you try both the recipes and they turn out well for you and your family. Thanks for the tip about the cooking temperature. It is 350 degrees as you saw on Melanie's site. I always appreciate a heads up when there is something missing in a post. Thanks for taking the time to tell me. Whoohoo!! – Thank you so much, Jamie! I'm really eager to get this book. I can't wait to start cooking from it! Made this recipe last night. Could this be made in the crockpot..what directions would need to be changed? Thanks for your question. I haven't ever had good luck with recipes like this (a lot of cheese and milk) in the crock pot. The cheese kind of gets curdled and gross. Bummer, isn't it. I would say stick with the oven on this one. made these many times, they are sooo yummy. Except that i think Mel uses heavy cream, instead of half and half. maybe i will try it with half and half. I made the Cheesy Au Gratin Potatoes for Easter, but my potatoes turned out runny ~ Not sure what happened, but wondering what I could do to avoid this next time? Thanks! I was wondering can I us milk instead of half and half? These are delicious! My mom, who is a good cook says she’s always struggled making au gratin potatoes- until I introduced her to this recipe! I add minced garlic to it on each layer, since garlic makes everything even better 🙂 Thanks for another delicious recipe! HELP — What temperature do I cook the au gratin potatoes at? I do not see a temperature listed. Thanks much & I enjoy your blog lots. Have made many of your recipes and have never been disappointed. So her original recipe calls for heavy whipping cream instead of half & half. Anyone have any thoughts on this? I am making this for the first time with guests coming over, so I am a bit nervous.